Offering you a complete choice of products which include designer kurti, designer kurti with necklace, denim kurti, rayon kurti and kurti collection. Dispatch :- 22-03-18.Set to set . Fabric :- Cotton and Rayon Cut paste. Please book your sets at earliest.Limited stock available.Set to set . 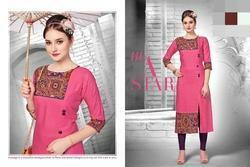 Size - M(38) L(40) XL(42) XXL(44) XXXL (46) Length --> 46"
Looking for Designer Kurtis ?